Chub - easy to catch, easier to scare. If you live near a river in England then the chances are that you will have chub fishing nearby. Different rivers provide different types of fishing but all chub share one pleasing characteristic: if they are not frightened they are eager to take many different sorts of artificial lure. Big rivers can provide tremendous sport with numbers of quality fish while smaller rivers and streams offer intimate fishing, stalking and selecting individual fish. The approach needed for these situations is very different. The answer to big bags is to find concentrations of fish in weirpools and fish	from a distance, as opposed to the painfully slow and stealthy hunt for a specimen from a tight swim under an alder branch on a shallow stream. 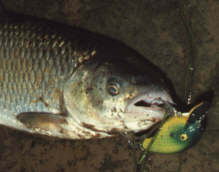 In low water conditions a lure is often the most successful bait for chub. 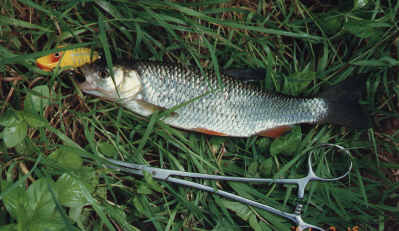 Although I have caught chub in cold water, I don't recommend winter fishing, and coloured water ends sport with lures. First I would like to go into detail about big rivers. As with all fishing, location is half of the	battle. Weirpools nearly always hold good numbers of chub, and the competition between them can make them crazy about lures. It is tempting to imagine that the rush of water and white foam would offer good cover for the angler but I have had much better results by moving as far away from the fish as I can get and using heavier lures to cast the extra distance. A fat Severn chub from Winnals. I saw minnows scatter as if a pike had struck, cast the "S" at the ripples and this was the result. Chub are quite happy with just about any shallow diving or surface plug in the 2" to 4" range but I have caught them on plugs up to 6" long when they have been really competing. I have one outstanding favourite for weirpools, the Manns 1-. This plug casts brilliantly and stays near the surface where the active chub are. 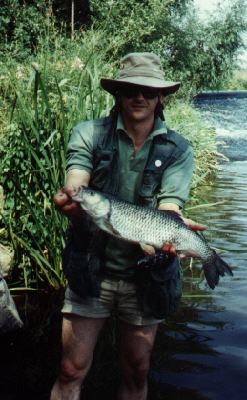 The hot, dry summer of 1995 had dozens of good chub packed tightly in the fast water at Bevere weir. This one weighed nearly 5lb, and took a Manns 1-, most of the chub were in the 3.12 to 4.04lb weight range. Retrieves should be steady and fast, preferably with, rather than across, the current. Be prepared for some awesome takes as the chub tries to grab the lure, turn and run in one movement. The rod tip will slam round perhaps 2ft! Don't strike, the chub is either on or not, keep cranking, I have had three takes on the same retrieve many times, hooking the third fish. Treble hooks should be of fine wire so they do not damage the chub, I always use a wire trace since there are plenty of pike in weirpools and the chub are not deterred by thick wire and strong line. They tend not to fight once they have felt the strength of the tackle, all the excitement is in the take. I have found that plug colour is important, I have no favourite but I will change colours until I find the one that works, sometimes a string of fish will come to one colour then no more until a	different colour is tried. I believe that colour variation is more important than lure choice. Over several sessions in the same weirpool the fish get more cagey, obviously they have all felt a hook or two and are reluctant to repeat the experience, change lures and colours. Remember to try to keep a	good distance from the fish. Sometimes a hotspot is apparent, do not flog it to death or the fish will spook, cast around and return to it periodically. It is possible to catch fish very quickly when they are really on, I once managed 12 fish between	3.5lb and 4.5lb in forty minutes at Bevere weir on the Severn. It is very frenetic when compared with much lure fishing. Frenetic is not a word that could be used to describe small river chubbing. It can take twenty minutes to work out how to approach a swim and as long again on a crawl or climb into position, then waiting until the right fish is in the right place, then just one cast. A sunny morning walking along the river Teme in August will show plenty of chub that	seem so unconcerned until you try to approach to casting range, then	they disappear, no mad panic or rush, they are just not there anymore. The chub in the Teme seldom grow much above 3lbs or so, it used to produce much bigger chub, but that was before the barbel invasion of the last twenty years. The size of	the chub though is not important, it is the problems in approaching and	catching them that matters. For stalking individual fish it is best to look for slow-flowing swims under far bank alders. Finding a bigger-than-average chub is a bonus, they are no more difficult to catch than the small fish but the search is as interesting as the	fishing. It pays to watch the target fish for a while to tune in to its movements, there is usually a clearly defined patrol route that the fish follows around the swim. I like to watch the fish and take advantage of its movements, trying to move when it is least likely to see me. Finally ready to cast I make a check of the tackle, no brambles wrapped around the rod tip etc, then a final check of the swim to decide exactly where I want to hook the chub. I watch out for the occasional small pike lying nearby that might grab the plug before the chub and spoil the approach work, also for any snags that might foul the lure or the hooked chub. There is only one plug for this type of work, the Heddon Meadow Mouse. It looks like a joke plug but it is a brilliant lure for surface chubbing. I will cast underarm, gently splashing the plug down about a yard in front of the patrolling chub. The chub will quicken a little, move in behind the plug as it wobbles	across the surface, then grab it. It is all over very quickly. The fish is hooked, landed and released in thirty seconds. This is very satisfying fishing but it is slow, a handful of fish at best in a morning's fishing. Spinning with Mepps #2 or #3 bar spinners will catch plenty of chub in large and small rivers, colour choice is important again, the right colour catches and the wrong one does not. If you want to catch small chub you can use small lures. It is not unusual to see a small shoal of "chublets" racing for a lure, like schoolboys chasing a football. I have caught a chub on a jig. I guessed there would be a chub in an undercut beneath a near-bank	hawthorn tree. It was a high bank and any attempt to approach the swim to cast a plug would have been clearly visible. I crept up behind the tree and poked the rod round the trunk before lowering the jig into the	water 5ft below me, I never looked into the water at all. I began jigging gently and after about ten seconds I was delighted to feel the hit as the chub obliged. The resultant disturbance landing the fish from such a high bank ruled out any more sport from that spot. It is a pity that there are not more swims where jigging could be used. I always use fairly heavy tackle for chub, they seem totally unconcerned about thick line when a lure is offered to them. I always use a wire trace because pike are always present and again the chub could not care less. This applies on even heavily fished waters where match anglers regularly resort to 1lb bs hook lengths and hooks as small as a 22. The tackle should be capable of dealing with good-sized pike that will grab the lure once in a while. I do not think it is clever to fish with tackle that is unnecessarily light, leaving lures in fish is unforgivable. Remember, chub love lures, they just hate people.